Mandatory minimums: Eric Holder, Rand Paul agree. 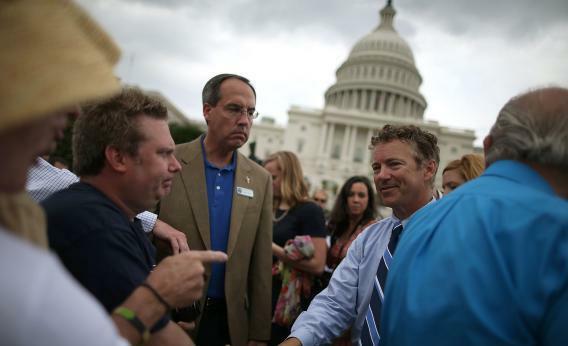 Believe it or not, Rand Paul isn’t the only Republican against the war on drugs. I am encouraged that the President and Attorney General agree with me that mandatory minimum sentences for non-violent offenders promote injustice and do not serve public safety. I look forward to working with them to advance my bipartisan legislation, the Justice Safety Valve Act, to permanently restore justice and preserve judicial discretion in federal cases. I introduced this legislation in March with Senate Judiciary Chairman Patrick Leahy as a legislative fix to the very problem Attorney General Holder discussed today. The Administration’s involvement in this bipartisan issue is a welcome development. Now the hard work begins to change the law to permanently address this injustice. Indeed, Paul sponsored the Justice Safety Valve Act earlier this year with Leahy, which would have allowed federal courts to ignore mandatory minimum drug sentences under certain conditions. The bill was referred to committee in March, and suffered a similar fate in the House the following month. Among the ten Democratic cosponsors of the House bill was one Republican—Rep. Tom Massie—a pea in Paul’s Kentucky libertarian pod. The federal government simply cannot afford to continue to house so many nonviolent prisoners for such lengthy sentences. According to a recent Congressional Research Service (CRS) report, the number of inmates under the Bureau of Prisons’ (BOP) jurisdiction has increased from approximately 25,000 in FY1980 to nearly 219,000 in FY2012. BOP prisons are operating at 38 percent over capacity, endangering the safety of guards and inmates alike. Last week, the Inspector General for the Department of Justice testified that it’s only going to get worse: the BOP projects system-wide crowding to exceed 45 percent over rated capacity through 2018. The economic cost of the prison population boom is staggering. Since FY 2000, appropriations for the BOP have increased from just over $3.5 billion to more than $6.5 billion. What about fiscal conservatives who are actually in office? Republican senators most likely to support the latest reforms include Sens. Chuck Grassley, John Cornyn, Tom Coburn, Lindsey Graham, Orrin Hatch, and Jeff Sessions—they all co-sponsored the Fair Sentencing Act of 2010, which eliminated the racially skewed disparity in sentencing for crack versus powder cocaine. Their offices have issued nary a peep about the news—granted, it’s recess, but it doesn’t take much effort to rustle up a two-sentence press release. Much has been made of the altered talking points in the aftermath of the Benghazi assassinations, but I think almost everyone has fallen for the president’s misdirection campaign. So Paul can rag on Obama and Holder six days of the week, but still has the bona fides to openly support the parts of their agenda he does agree with on the seventh. His colleagues could do the same without running much of a risk, but they probably won’t.